little behind with posts after taking a break after the hectic run up to Christmas and doing some work on the next newsletter! I am so excited for you to see it but without further ado, here is a lil beauty review. 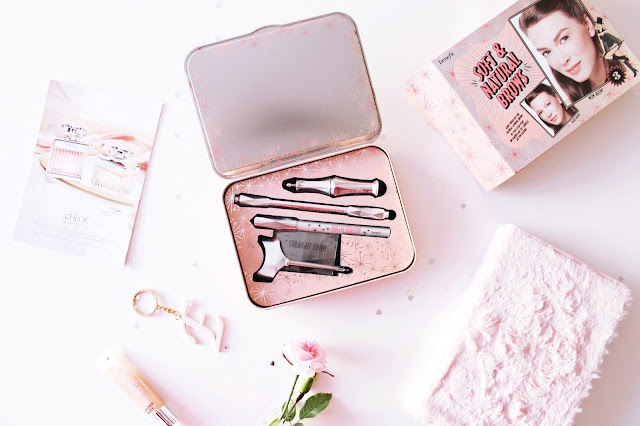 I received the Benefit Soft and Natural Brows kit as a belated Christmas gift from my mum. I'm so grateful to be able to try it as Benefit products are a little out of my budget and can rarely afford them, yet I've heard good things about their brow products! The packaging is stunning, like most of their products. 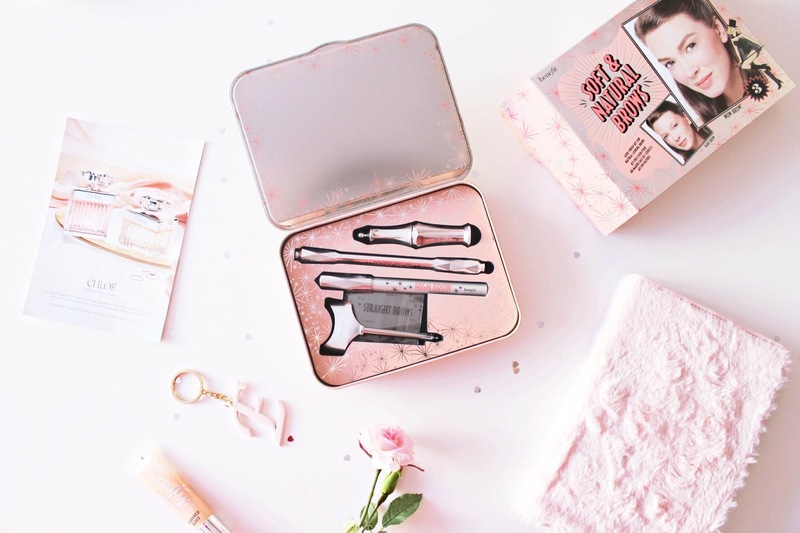 The brow kit comes in a beautiful little tin; I just love how much work has gone in to designing it. Here are the different tools I received in the kit: the creamy High Brow pencil highlighter, the double sided Goof Proof brow pencil, brow gel and stencil. My favourite of all was the High Brow highlighter, it's amazing and like nothing I've ever tried before! It's so creamy and pigmented and lovely to use. The only product that I didn't get along so well with was the Good Proof Brow pencil. I found it the opposite of the highlighter pencil: it really dragged and was dry and awkward to use: I'm surprised that I had to scratch so hard to release some pigment, so much that the tip snapped off! 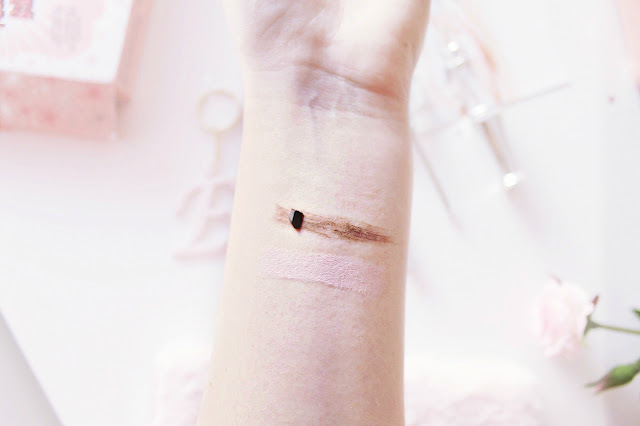 However, it's definitely smudge proof, with good staying power and I understand that it may be preferable to have a less pigmented pencil when filling in the eyebrow, as it looks more natural when done delicately. However, I didn't like how it dragged upon the skin, tricky to use when working around the delicate eye area. It is such a highly commended and well loved product though, so I am not giving up on it yet! I would love to experiment with some primers and see how it performs. I found it did perform a lot better when used on top of the highlighter: you can see swatches of both above. Ahhh the dreamy highlighter! The brow gel seems really good, super long lasting and good at shaping and taming the brows! The stencil is still something I will have to get the hang of haha, even though the set came with a helpful guide on how to use it. 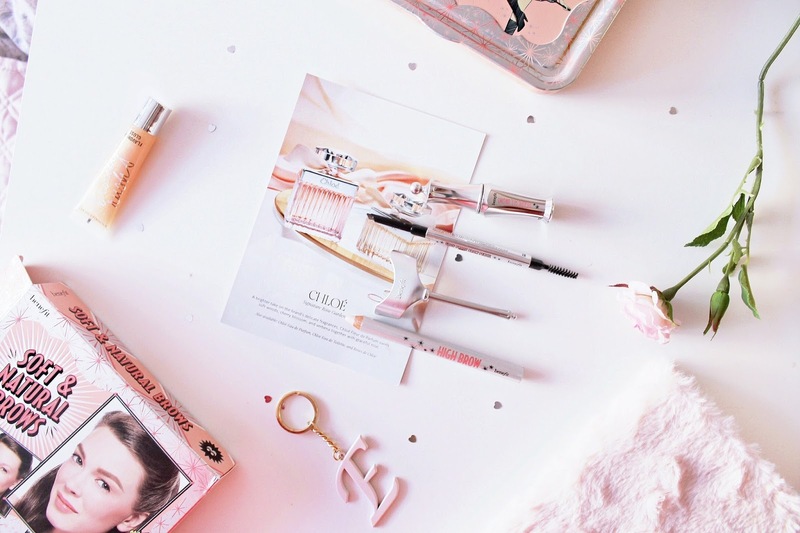 Have you ever tried Benefit's brow range? What did you think? I'm so in love with the packaging, the little silver geometric lids are gorgeous. I could spend all day trying to photograph them! I actually much prefer their gels and potions (I use the Ka-Brow) daily... though I suppose in general I'm not a fan of the mechanical eyeliner pencil as I find they look strange when not applied correctly whereas any gel applied with a brush is much more apt to look more normal. I've definitely been very pleased with Ka-Brow though and would recommend it over their other brow products. Ah sorry I missed the chat, but so glad it went well. I love how you photographed this product. I actually picked up the pencil in duty free and loved it, but I do have dark hair so think it might be more forgiving. I love Benefit, I have Watts Up highlighter and gimme brow and they are amazing. 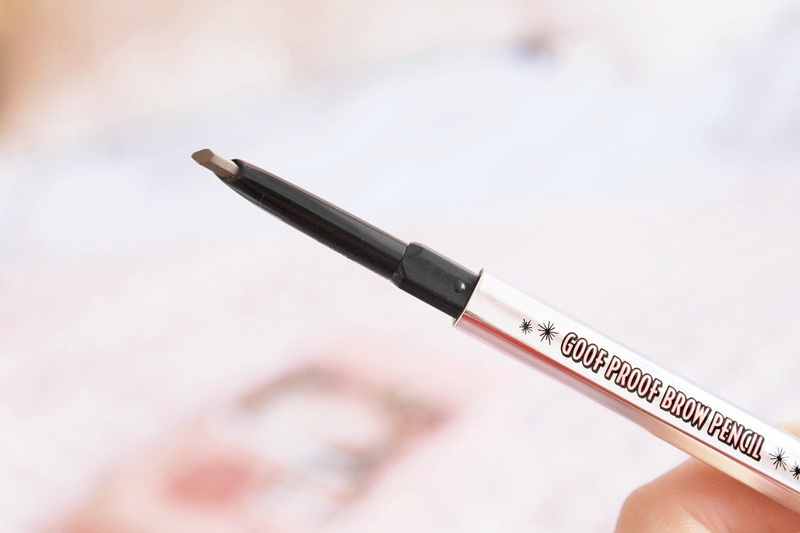 It's a shame about the goof proof brow pencil, but the highlighter looks amazing! Great review, I love your photographs! This looks like a fab kit! 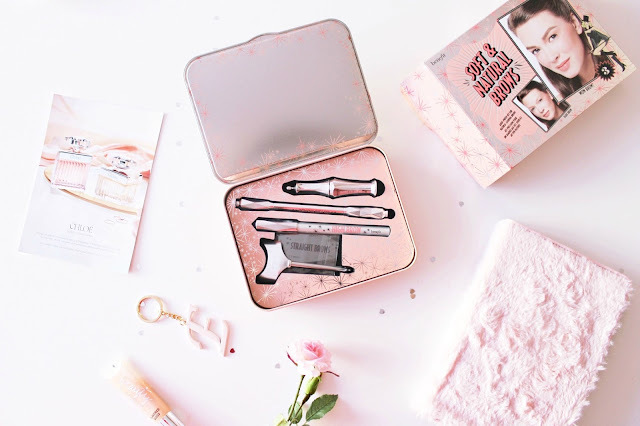 I was looking for such kind of information and finally I found lovely blog which are giving Benefit of Soft and Natural Brows kit. Professionally I am an educational writer and providing statistics assignment help - http://www.assignmenthelpfolks.com/statistics/ to students at Assignment Help Folks but I am interested in fashion and regularly using brow products. So I am always looking for such kind of blog. I am also recommended your website to my friends and more people who also loved brow products. Thanks. First of all let me just say that I love your photography! That alone makes me want to buy all the Benefit brow products! I haven't tried any of their brow products yet, but I do love the Roller Lash mascara. 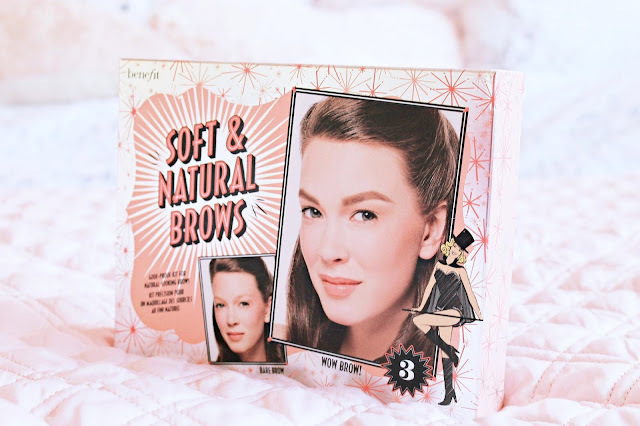 I am glad to read this lovely blog about Benefit Soft and Natural brows review. I love reading such blogs and I will get to see more. I am providing English essay help - http://www.essaywriter.org.uk/english-essay/ at Essay Writers UK where I am right now working and I would like to share this with my students who are also interested in fashion and beauty. Thanks for sharing it with us.